How nice would it be to almost get your down payment back after you purchase your brand new home?! Depending on how much you’re planning on putting down and how big the house you want to buy is, you could save nearly your whole down payment when you buy a single family home in Starling at Big Lake! The next 20 single family home buyers will receive $15,000 off the list price of their new home from the developer! Starling at Big Lake is an active community that is secluded, without being isolated. You’ll see what we mean when you visit the single family showhomes by Blackstone, Art Custom, Gill Built, and C2 Homes and our multi-family builders Rohit and Averton. On your way you’ll drive by our teaching dock, gazebo, parks, and walking trails that help make the community what it is today. 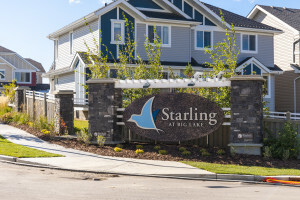 So when we say you’re saving big in Starling, we mean it – you’re getting all the luxuries of a well-connected community for the lowest possible price! Come check out what Starling at Big Lake has to offer today!